Pain au Chocolat a la Daniel! Anywho, dahhhhling (is it working?) I took a quick but much needed escape to NYC on my 24th birthday weekend with an old friend where I imagined new things for myself and set new goals... and that was the most refreshing and well-timed gift from God yet. Enough about me... lets get back to the reason we are all (meh?) here... CAKE! 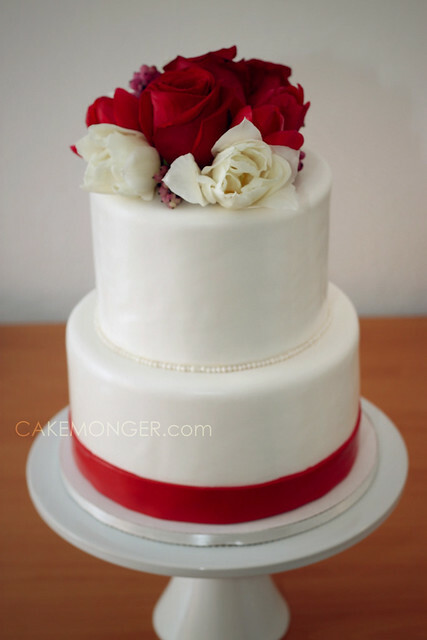 The following cake made for a wedding reception at the Clift hotel. It was a really chic/intimate gathering. I hope the cake found a beautiful spot somewhere besides the stainless steel counters it was assembled on. Well, now that I've lost my coffee buzz, I must say 'till next time! But sooner this time! Been holding on to this photo for a while now. Here is a Vanilla Cake with Vanilla Bean Custard and Sliced Strawberries that I made for one of my very favorite clients. Marie, you are always a pleasure to work with!